Philips HTL9100 review | What Hi-Fi? We don’t really expect innovation from soundbars. They’re simple products after all: speakers shoved into a bar to save space and boost TV sound. Many of them come with subwoofers nowadays, along with a few wireless tricks like Bluetooth, but that’s about it. The Philips HTL9100 is different. This one gives you convincing surround sound. You wouldn’t think it at first glance. It looks like any ordinary soundbar, albeit one that’s had a makeover. Covered in black cloth aside from a brushed-metal band with a single button, it seems like a very simple device. But don’t be fooled by the minimalist vibe. The Philips HTL9100 has an impressive party trick: the ends can be jettisoned like escape pods and turned into rear satellite speakers. These are wireless, communicating with the main unit via a 5.8GHz signal to avoid interference from wi-fi or Bluetooth signals. They run on built-in rechargeable batteries that last up to 10 hours before returning to the mothership for more juice. It’s a very good idea, and it works. If you want to be immersed in sound, there’s no substitute for actually being surrounded by speakers. In this exploded configuration, you’d be sitting in the middle of two 1in tweeters and four 2.5in midrange drivers. The HTL9100 decodes Dolby Digital and DTS soundtracks, and is clever enough to switch to a standard 5.1-channel signal once the satellites detach. It’s actually a 4.1 system with a virtual centre, but it’s hard to tell the difference. This is more effective than most of the ‘virtual surround’ options we’ve heard. We put on a Blu-ray of Mission: Impossible – Ghost Protocol to watch people shooting at Tom Cruise. Audio panning is impressive: if you want to hear bullets and shrapnel zing past your ears, this is just the ticket. A system like this could never match the power of a proper surround speaker set-up, but soundbars are designed for people with limited space. The HTL9100 offers a perfectly functional pop-up home cinema system that you can tidy away without leaving evidence behind. We plug the satellites back in and find it’s wonderfully simple. There’s a proprietary connection to the main unit ­– supported by magnets – and you don’t need to fumble with plugs. We could (and did) do it with our eyes closed. As before, the Philips recognised the situation and switched to stereo accordingly, acting as a ‘regular’ soundbar. Time for some TV, and The Great British Bake Off is a good choice. There’s plenty of chatter amid culinary chaos and dynamic background music. (Also, we like cake.) It’s a wide soundstage, even without the speakers spread out. The sense of space is excellent; a far cry from the tinny, boxed-in sound of the average flatscreen TV. There’s a good amount of detail, with a solid sense of texture to the scrapes and clatter of pots and pans. Next we switch to one of the music channels and crank the volume up. The HTL9100 stays composed, demonstrating great power without getting shouty or hardening up. Integration with the subwoofer is good, and it’s easy to forget the soundbar is there at all. The packaged subwoofer is impressive. The bass is substantial, but never flabby or overpowering. It’s smooth and silky, with minimal delay, and adds good depth to anything you care to listen to. You can boost its level on the remote control and the soundbar keeps track of it with a bar of LEDs. The sound felt the most natural with the bass set at just over halfway. As is the norm with a lot of soundbars, you get various optional processing modes that don’t do very much. Virtual Surround is a little pointless when you can have actual surround. Auto Volume prevents big jumps in loudness but has a negative effect on dynamics. Night Mode is supposed to boost dynamics with the volume low, but we couldn’t make out much of a difference. Then there’s DoubleBASS, which provides an alternative way of getting the police to visit. We do like the HTL9100’s Bluetooth compatibility. Pairing is a little fiddly at first – you need the remote control to trigger a search for the device you want to pair, and there’s no on-screen interface. It doesn’t take long, though, and very soon we were seamlessly delivering songs from a smartphone. Physical connections are impressive too: you get two HDMI inputs and one each of optical, coaxial, analogue stereo and 3.5mm. It’s definitely not a problem if you want to use the soundbar with a TV, Blu-ray player and a games console at the same time. 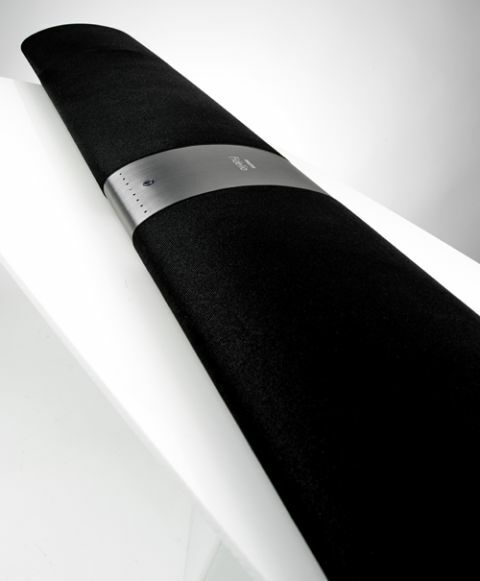 We really like this soundbar. It sounds great, it’s versatile, and we think the surround-on-demand option is a really neat idea. If you want good sound without the hassle of trailing cables and fiddly set-ups, this is the way to go.